In the past, the design of new two wheeler models at Mahindra was based on building prototypes and driving them on a test track. The limitations of this approach were that prototypes took an average of five weeks to build and had to be run for about two weeks to evaluate component durability. A major improvement came when test rigs were introduced and used to recreate the conditions of the test track using automated equipment that eliminated the need for a driver and could be operated 24X7. This approach saved time, however, a complete vehicle prototype iteration was still required for each major design change. 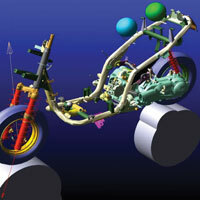 Mahindra selected MSC Software’s Adams, the most widely used MBD software for over three decades. MSC Software is the world leader in both MBD and FEA software. Speaking the language of both domains gives MSC the capability to develop the rich data transfer required to fully integrate them. Mahindra has evolved a new virtual testing design process that uses Adams to simulate the performance of new designs and accurately predict their performance prior to the prototype phase. Basing the design process on simulation rather than testing provides substantial time and cost savings. The largest savings come from being able to evaluate alternative designs without having to build a prototype. The number of prototypes required to bring a new two wheeler to market has been reduced from 4 or 5 in the past to 2 or 3 now. The time to build and test a new prototype is about 7 weeks so the company has been able to bring new two wheels to market at least 7 to 21 weeks faster than was possible in the past.